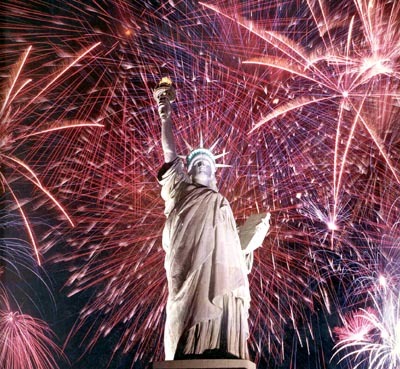 On July 4, the people of the U.S. marked the passing of another year's perfunctory, Independence Day festivities. The date, also, was occasioned by the formal announcement from physicists at CERN (European Organization for Nuclear Research) that, according to the banner headline at CERN's official website, "Higgs within reach […] Our understanding of the universe is about to change […] [Our] experiments see strong indications for the presence of a new particle, which could be the Higgs boson." Thus, augur the smart people at CERN, a change in our fundamental understanding of the universe, and our place as human beings in it, is at hand. From their lips to the mouth of the God Particle, this development, if true, would be cause for celebration -- that a display of fireworks should be in order -- because of an embrace of the philosophical and social implications of this discovery could be the starting point of a profound form of independence: the release from ossified systems of thought and being, such as those dominating the present era, including the hagiography of U.S. Independence Day. The people of the U.S. need independence from the demonstrably false notion, held by so many that within their debt-enslaved, corporate interest-beholden lives, they possess any degree of meaningful independence. As U.S. citizens, we are free to, without question, proclaim to the now credulous world how free we are-- but when a citizen resists and takes action (e.g., Bradley Manning) he will, in rapid order, grasp the true nature of this sweet land of liberty. As OWS activists have recently apprehended, under the present order, an individual is at liberty to practice freedom of speech, as long as by doing so, one does not threaten the agendas of the privileged and powerful. The indicators strongly suggesting the existence of the Higgs Boson -- a particle that serves as a creator and connecting principle of (seemingly) disparate matter -- comes to us in an age, when the people of the U.S. seem unwilling or unable to connect the fact that greenhouse gases, emitted from the tailpipes of their automobiles idling at drive-thru windows of fast food outlets serving industrial bred, raised, hideously exploited, cruelly slaughtered, and carelessly processed animal flesh (an even larger contributor to Climate Chaos than the aforementioned automobiles' exhaust particles) are responsible for less than propitious changes to global climate patterns. News of the Boson particle -- the so-called God Particle -- into public consciousness arrives, as well, at a time, when as Carl Jung aptly posited, "the gods have become diseases." In short, estranged gods (i.e., patterns of the human psyche that are analogs of terrestrial and cosmic patterns) invade the ego and reside therein as pathologies i.e., compulsions, depression, anxiety, addiction, because their purpose has been discarded and forgotten e.g., the recognition of the sacred quality of life and the evocation of the numinous through ritual. And mainly to bring to humankind the recognition that we, most definitely, are not gods ourselves…to the understanding that our mastery of fire and machine should not infect us with the hubris to believe we are the masters of the universe. Therein, liberals retreat to their comfort zones, while the forsaken laboring class constructs insulating walls of resentment. Dialog becomes prohibitive. "Reasonable" liberals gape with mortification at those to the political right and left of themselves, and attempt to cope by erecting buttresses of unassailable reason…that outsiders perceive as citadels of implacable snobbery. But when the intellect learns the painful dance of self-awareness i.e., develops an awareness of the living landscape of the heart, alive with breathing imagery, then it becomes possible to know the world, sans a fool's swoon of self-referential arrogance. As is the case with any natural disaster, the seemingly boundless font of stupid extant in the current day U.S. is a sublime thing (as in the relationship between the words, awe and awful) to behold. The scene unfolding before us evokes the mortifying sense of awe experienced while watching a seething nimbus of locust descending on a region's harvest crop. Yet, obstructions are not necessarily a bad thing…Barriers can stop one's drift and slow down manic evasions. There must be something providential glimpsed when gazing upon the blank visage of the hopelessly dim…something we can learn from those unwilling or incapable of learning. But what that is, I, myself, am apparently too dim to glean. I feel like an idiot when I contemplate the unfolding of eternity. How can one match the eloquence of the night sky, or the weave of a spider's web stippled with morning dew? Continue with the work you were born to perform…Live in the world…to demure, would entail falling into the ranks of an idiot's parade comprised of one. Accordingly, let's make a few connections: The present order has wrought economic tyrannies and inevitable environmental collapse, and is proliferate with the seeds of its own destruction. It should be evident to anyone with the cognitive capabilities of an over-ripe squash that global, neoliberal capitalism (and its game-rigging, political class-owning, mammon-worshipping cartel of privileged thieves) has entered into an exponentially increasing state of entropic breakdown. Our tactic: Act is if the doom system has already collapsed (becoming part of the system is like a chicken going to work for KFC to "change the system from within") and beginning to imagine and create the world anew. Phil Rockstroh is a poet, lyricist and philosopher bard living in New York City. He may be contacted at: phil@philrockstroh.com. Visit Phil's website or at FaceBook.